1. Consensus opposition to geoengineering appears to be eroding. 2. The discourse on geoengineering is not being driven by ignorance of the risks. Overwhelmingly, skepticism of geoengineering is driven by anti-government paranoia and scientific illiteracy. Leftists should bear this in mind, and avoid playing on right-wing tropes about government overreach and scientists who are "playing god" in their critique. 3. Geoengineering complements the fight for a sustainable economy. No one argues that, say, investments in public transportation will distract from the fight for sustainable energy, or that we have to choose between reducing our consumption of meat or reforesting initiatives. In cases like these, everyone is perfectly capable of understanding that the fight against climate change will certainly involve a wide range of changes and investments, that none of them can solve the problem alone, and that we have to fight for all of them at once. So it remains, for me, unconvincing that when it comes to geoengineering, civilization can no longer walk and chew gum at the same time, and will inevitably opt for its proposals at the expense of the broader agenda. There's a lot that needs to be done, and we need to do all of it. 2. Greenpeace. Responses to calls for evidence, Part VI. Geoengineering the climate: Science, governance and uncertainty. 3. Corner, Adam, Nick Pidgeon and Karen Parkhill. Perceptions of geoengineering: public attitudes, stakeholder perspectives, and the challenge of ‘upstream’ engagement. 4. Harvey, Chelsea. World Needs to Set Rules for Geoengineering Experiments, Experts Say. Scientific American. 5. Climate Engineering Conference 2017 Conference Report. 6. Edward A. Parson and David W. Keith. End the Deadlock on Governance of Geoengineering Research. Science. 7. Tingley, Dustin and Gernot Wagner. Solar geoengineering and the chemtrails conspiracy on social media. John McCain's reputation as "honorable" emerged in 2000 in contrast to the politic, smooth-talking candidacy of George W. Bush. He maintained the posture of a gadfly throughout Bush's presidency, and Democrats opportunistically praised him for it because they hated the president. As readily as they declared McCain honorable, Democrats retracted the compliment. Because he was their opponent, McCain's numbers were miserable for most of Obama's presidency, hovering at 42% by 2013. It was only in the Trump era, after his sensational vote against an Obamacare repeal bill, that McCain won back a majority of Democrats, with numbers surging to 71%. Once again, Democrats declared him a man of honor and principle; once again, it just so happened that McCain was perceived as a foil to a Republican president. Samuel Farber, writing for Jacobin, argues that "It was that sense of honor that many liberals found admirable, making them willing to overlook McCain’s hard-right politics and praise him upon his death." The truth, however, is probably much more mundane. When it was in their partisan interest to do so, liberals praised McCain as an honorable man - and when it was against their partisan interest to call him honorable, liberals attacked him as a dishonorable sellout. Republicans, of course, behaved identically. There is not very much evidence that "honor" acted as some kind of of deeply-rooted cultural force that either impeded or enhanced John McCain's power; as far as I can tell, it was just a vacuous rhetoric that people used to articulate the predictable preferences of partisan politics. 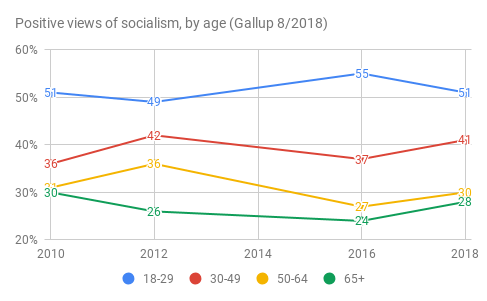 As I argued recently, I really don't think that these fluctuations are terribly significant: since 2010, the only age group to have shifted their views on socialism outside the margin of error are Generation Xers (+5 in the past eight years). But if you are going to try to tease out a change in the microtrends, it's hard to miss what's going on here: the 2016 election temporarily polarized views between millennials and everyone else, and since then, attitudes towards socialism have generally drifted back to the norm. The much-heralded dictatorship of the teen has gone soft; olds, meanwhile, are becoming more radical across the board. The upshot of course is that public support for socialism has generally grown over the course of generations rather than years. Perhaps socialists who want to build institutions and win political power can underperform or overperform the expectations these numbers imply, but we should at the very least maintain a clear view of how our base of support has actually changed in the past decade or so. A while back, I wrote a piece noting that leftists often complain about "ideological sectarianism, social tribalism, and interpersonal feuding". In explanation for this, I argued that "the problem is anti-socialism", which can infiltrate socialist spaces through liberals who are not substantively committed to the socialist project. Noah Baron has responded with a critique of this argument - you can read it for yourself here. I don't think it would be productive to respond to everything he says in this post, but he does make four major points that I want to respond to. 1. Has socialism's popularity changed? Much of my original piece asks readers to reflect on "how marginalized and reviled socialists are in the United States." In response to this, Baron heralds "the appeal of socialism in the United States today," insisting that my data is "outdated" since "over the course of the past three years, things have changed significantly." A Gallup poll which reports that Democratic views towards socialism are "little changed from 2010", that millennial views towards socialism are "the same as in 2010", and which concludes that "Despite the increasing prominence of socialism in the public discourse in recent years, little has changed in Americans' attitudes toward the concept at the national level." A Pew poll headlined "Little Change in Public’s Response to ‘Capitalism,’ ‘Socialism’"; it goes on to add that the "word ‘socialism’ triggers a negative reaction for most Americans," a trend that is "little changed from April 2010." I think Baron's perspective is understandable - first because there is, as Gallup alludes to, a lot of hype about ascendant socialism in the discourse today; and second, because Gallup's latest poll was widely misread as evidence for ascendant socialism, when it's really just evidence that support for capitalism is cratering. Look at the overall data on socialism's popularity, however, and what you'll see are fluctuations within the margin of error; a marginal bump in 2016 among a few demographics; and since then, returns to the norm across the board. 2. How does opposition to socialism compare with opposition against other identities? Baron also takes on a Gallup poll I cited in which respondents said they were less likely to support a socialist for president than a president who identified with any other identity category - such as "Black," "gay or lesbian," "a woman," and so on. His first objection - that "the results are dated to June 2015," before socialism's supposed ascendance - is not difficult to handle. As noted in point (1), attitudes towards socialism only improved marginally among certain demographics in 2016, and have since then deteriorated back to the norm. That DSA's membership has, since then, grown "by a factor of ten" - from .002% of the population to .02% of the population - does not call those numbers into question. Neither does the fact that some self-identified socialists have won some primaries since then; as it turns out, all of these other categories have won primaries, too. Baron's second argument, meanwhile, is deeply confused. He observes that the poll would be different if you replaced identities that are more popular than socialist (Catholic, gay) with identities that are arguably less popular (such as Catholic Republican and gay Democrat). He also suggests that it would be different if you added the identities "liberal" and "conservative", which he implies are even more unpopular on the logic that self-identification for those numbers is lower than "would you vote for a socialist president" numbers. It's not clear to me that socialism would actually come out ahead of these new groupings that Baron has introduced - but even if it did, this does not amount to a case that "the poll is misleading." Socialism as such is less popular than Catholicism as such; that you can make the Catholic less popular by associating her with Republicans doesn't change that. Neither does this argument that anti-socialist opposition is different than opposition against other groups (since it's "an expression of political and ideological belief, rather than animus against this or that identity group"). All this poll suggests is that socialism qua socialism is less popular than Catholicism qua Catholicism; they may face opposition for different reasons, and these reasons may be worth reflecting on, but this does not somehow make opposition to socialism any less real, or the poll any less credible. 3. Is left infighting a problem? Here, Baron is responding to a post that exists almost entirely in his imagination. He writes that I "decry" and "bemoan" infighting on the left, which I supposedly see as a "crisis", and "as a 'problem' that must be 'solved'" - in fact, not just a problem, but "our fundamental problem, with no cure prescribed but presumably involving purging them or alienating" anti-socialists. The picture he's painted of me here is a popular caricature of those of us who insist that some leftists may in fact be opponents of socialism, and who hope that socialism prevails. It also, however, is a completely unfounded view of my position, with zero basis in either the text or my general politics. I am a radical materialist. For this reason, I believe that support for socialism, opposition to socialism, the emergence of class consciousness, the phenomenon of liberal squishes, and so on - that all of these things express the material progress of history. I emphatically do not believe that it is the liberalism of various activists that empowers capitalism, or that socialists can overcome this supposed obstacle by winning the argument, or by purging and alienating them. This is why infighting is not, as I put it in my piece, a problem "at the level of world-historical politics". Instead - and as I argue from the beginning - infighting is only "a problem" insofar as it "weighs on the mind of the modern activist left". Though it is not "our fundamental problem," it does create a "strain of anxiety" for many leftists that falls "somewhere on a spectrum between stressful and traumatic". My concern, then, is less political than therapeutic; I want to help activists to understand where a significant source of stress in their life is coming from, not because I think that this is an issue that will make or break socialism, but because I want socialists to be at peace. This is an essential concern of quietism - a philosophical tradition that I identify with closely, and that I have written about a number of times. 4. So what should socialists do about anti-socialists? Try not to let them drive us crazy! For some people, articulating criticism seems to provide some personal relief; this often works for me, because it helps me pinpoint precisely what bothers me about a certain argument or a certain line of rhetoric. For some people, venting - by dunking on anti-socialists, or by commiserating with friends about them - seems to help. Some socialists seem to get a lot out of trying to mediate and diffuse conflict on the left, and if this helps them cope with class struggle, very well. But regardless of how one wants to cope with the problem - a problem in the sense that it causes us anxiety - we would do well to recognize that political conflict is baked into our discourse. Anti-socialism has a long and ugly history in the US, and polling generally confirms that it is still with us. As I noted last time, "what would be surprising is if it didn't wreak a massive amount of havoc on the left" - but if socialists can understand their stress and anxiety as an affliction of this havoc, that insight might make their lives a little easier. Much of Cohen's reply sets out to prove that "the past several decades have produced significantly greater tolerance of leftists". This is supposedly in response to my "claim that there has not been...any change" - but of course, I never argued that there has not been any change since the Cold War. Things are obviously better than they were in the mid-twentieth century; this is obvious and uncontroversial. The specific argument I make in (1) above is that attitudes have not significantly changed since 2015. I argue this in direct response to Cohen's claim that my 2015 polling numbers were "outdated". Most of the rest of his reply attempts to debunk my "pessimistic claim that there...likely never will be (at least in the near future) any change in the acceptability, tolerance, or embrace of socialism". Among other things, he singles out as a "reason for optimism" the fact that "Millennials...would be willing to vote for 'a socialist.'" This "pessimistic claim" of course appears nowhere in my post. And if Cohen were even remotely familiar with my politics and my writing, he would know that I have written extensively on Millennial support for socialism (See I, II, III, IV, V, VI, VII, etc.) as a reason for optimism. To his credit, Cohen admits that he is "not familiar with the rest of [my] work" - but unfortunately, this has not deterred him from repeatedly making wild and unfounded claims about my politics. My impression is that Cohen is interested in optimism vs. pessimism and multi-tendency vs, orthodoxy debates, and would like to use me as the foil for some polemic about hope and ideological diversity; that's why he's even willing to venture all kinds of elaborate armchair psychoanalysis (I have a "pessimism complex" (!) that is "undergirded" in "paranoia" (!!)) of a writer who he has barely even read. This is not a formula for a productive conversation, which is too bad because there is probably one to be had about our points of actual disagreement. For example, I think it is Cohen who is being too pessimistic when he warns that talking about anti-socialism would have a "chilling effect" and "cast a pall over the movement"; I think that leftists are perfectly capable of discussing the role that bourgeois ideology plays in our discourse without that somehow crippling our fight against capitalism. Whether Cohen thinks otherwise because of some "pessimism complex" or some other ideological affliction, I won't venture to guess. I remain baffled by this argument that the left should pack this Supreme Court - with two new justices. Any court-packing strategy is going to carry a certain amount of risk, which means that if you are going to do it, you had better get something out of it. Two justices don't justify that risk - and the case that this is somehow a safe or reasonable ask, in a way that four or six justices are not, is extraordinarily weak. Here are four arguments for six instead of two. 1. Two justices don't even guarantee you a majority - but six do. When Republicans refused to vote on the Garland nomination, they didn't just steal a seat - they stole majority control of the court, which Democratic appointees would have gained for the first time since 1970. The liberal-left is not simply entitled to a seat or two. It is entitled to a controlling majority. In half of these scenarios, not even two new justices are enough to overcome a poorly timed vacancy - and the radical right majority remains in place. To ensure liberal-left control of the Court, activists have to call for at least six new justices. 2. Two justices do not remedy the Court's dramatic rightward shift in recent decades - but six justices do. This is because even if two justices gives the liberal-left bloc a majority, the most likely outcome would be a one-vote majority. As the above table indicates, this happens in two out of three scenarios where Democratic appointees win control, putting every decision at the mercy of the most conservative Democratic appointee. Remember when Justice Kagan voted to destroy Obamacare's Medicaid expansion? She's now the swing vote in every case. Six justices don't necessarily solve this problem either, since in the worst case scenario (Trump replacing Ginsburg and Breyer) court-packing would still only win the liberal-left bloc a one-seat majority. Nevertheless, in five out of six scenarios, six justices would expand the liberal-left bloc's majority to at least three, giving it the breathing room it needs to advance a progressive agenda. 3. The risks of the two-and-six-justice court-packing schemes are probably comparable. Simplistically, one could suppose that court packing schemes assume more political risk with every additional justice you nominate; this is the implicit logic behind calling for two justices, but not six. In practice, however, any court-packing scheme is going to face the same maelstrom of outrage from the right: attacks about broken norms, unconstitutionality, ascendant dictatorship, the politicization of the judiciary, the launch of a court-packing arms race, and so on. Whether we add one justices or a dozen, the same script will inevitably play out: Republicans will shift into full-throated DEFCOM 1 "our very Republic is in peril" mode; conflict averse, procedurally-obsessed centrists will wring their hands; and a handful of liberal flakes will grandstand and bravely defect. Beyond that, what would matter is not the number of appointments so much as the stories one can tie to them. Ten appointments would give the right a "double digits" attack; nine would give them "doubling the size of the court"; and seven or eight would give them a "historically unprecedented" talking point. But six is the number effectively proposed by FDR; six has a story of political necessity behind it (see points one and two); and there just aren't many attacks that you can make against six that you can't make against less ambitious proposals. 4. Six justices is a strong opening bid for probable political negotiations. So far I have given reasons why six new justices is the correct demand on the merits, the one that can guarantee the liberal-left control of the court and pull it out of the reactionary center - but there are also reasons why activists who are willing to settle for less (?) should be willing to increase their opening bid. Both have to do with the enormous pressure that even a two-justice proposal will face to scale back its demand. First: if any of the adverse vacancy scenarios identified in point (1) materializes after the liberal-left has made two new justices our signature demand, we will be cornered: we will have to either abandon control of the court, or abandon our previous demand and ramp up to a new one. The shift in demands and rationalizations would play into the inevitable right-wing narrative that this is not a matter of justice, but a naked power-grab; it would be far less palatable than if we began with six justices as the reasonable baseline. Second: even partisans of the two-justice strategy should recognize that political negotiations will pressure them to bargain down. The right will frame their ask as a hardball, uncompromising demand; centrists will call for some kind of deal (for example, the recurring proposal to impose term limits and regularize appointments); and the liberal-left, having settled on two justices, will have no room to maneuver. Make your demand six justices, and if this proves unpalatable, scale it back; this wins you the mantle of compromise and four to two appointments. The six justice proposal provides a wide range of strategic and political advantages that the two justice proposal cannot. It has no additional liabilities. There is, as FDR said of his own six justice proposal, "nothing novel or radical about this idea." If you want substantive and lasting justice on the Supreme Court in your lifetime, six new justices is where it begins. 1. Almost all of the growth in carbon emissions is coming from outside of the US. Moving forward, emerging economies will account for 90% of it. This is why so many international efforts, like the UN's Green Climate Fund, exclusively "support the efforts of developing countries to respond to the challenge of climate change". If the aim of a green jobs guarantee is to fight climate change, why would we focus on redevelopment in the first world rather than development in the third world? 2. Suppose, then, that we decided to launch some kind of green jobs program that pays folks from the US to work on development projects in the third world. Why are we sending people from the US to build windmills in China instead of paying people in China to do this? This is not an argument that we can ignore adaptation efforts in the US, but it does call into question our priorities. Though the liberal-left continues to give lip service to climate change as a "global challenge", our specific policy proposals - and all of the popular momentum behind them - are narrowly focused on the domestic front. The green job guarantee is just another chapter in the same story.